Rotary broaching is fantastic for making small forms like hexagons and squares in soft materials like aluminum, brass and mild steel. However, when it comes to aligning multiple holes using a rotary broaching tool, the operation becomes extremely challenging. 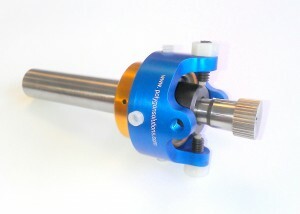 Most rotary broach holders have a free turning spindle which does not allow for alignment of the holes. The rotary broaching brake is a new mechanical solution for aligning broached forms in machined products. 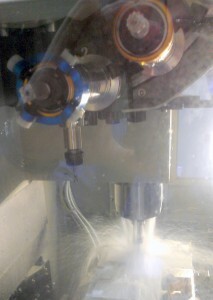 The rotary broaching brake was used recently at the 2012 IMTS show in the Hardinge booth. Hardinge’s innovative Bridgeport® GX 480 APC Vertical Machining Center held multiple broach holders by Polygon Solutions. However, the block was machined with square holes which were aligned to other features on the part. The squares were machined using a broach holder with Polygon’s new rotary broaching brake. The rotary broaching brake is a lightweight, low profile tool and easily fit into the VMC’s tool changer. It easily slides onto the head of the holder and does not require special tools for adjustment or assembly. The brake can also be easily removed for operations where it is not required. Polygon Solutions Inc. is a Florida based manufacturer of rotary broaching tools including holders, broaches, special broaches and gages. The rotary broaching brake is another innovative tool designed by Polygon Solutions for modern CNC machines. Machinists prefer Polygon’s tooling due to innovative design and easy-to-use features.